Successfully Added Thrifty USB Car Charger Hub to your Shopping Cart. USB Car Charger Hub with standard and mini-USB slots. Charge all your USB devices instantly from your vehicle's cigarette lighter slot! Do you ever find your iPhone, iPod, cell phone, or any other USB powered device running out of power more often than you would like? 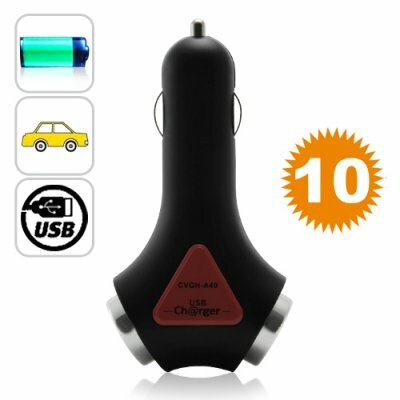 If you are the type of person who spends more than 15 minutes a day in your car, put that time to good use and re-charge your personal electronic devices with this USB Car Charger Hub! This simple but effective USB Car Charger Hub allows you to add two USB charging ports to your car, as well as a mini-USB port, making it easier to keep your cell phone, MP3 player, digital camcorder, and other USB powered devices powered-up. Simply plug it into your cars cigarette lighter and you instantly have two USB charging ports for recharging on the go. Available in our warehouse now, order today and we'll express ship it out tomorrow. Brought to you by the number 1 source in wholesale Chinese electronics, Chinavasion.